Last week on our Going Native in Tenerife blog we had a virtual house guest and he was such a success on Going Native that we thought we’d invite him over to Real Tenerife for a quick sojourn. Mike was the sort of guest who’s a real pleasure to have; he ate whatever we were eating, caused no extra washing up or expense and was as funny as an MP’s expenses claim. However he did moan (a lot) about the lack of scones here! Mike Harling came to us from the United States, via West Sussex and is currently on a virtual blog tour. Mike has an extremely funny book out called ‘Postcards from across the Pond’ about his life as a US ex-pat living in Britain. Buy it, it’s a real hoot and a perfect holiday read. Ahhh, back on the beach. Tenerife is nice; I like visiting a place I have to look up on Google Earth to find. Turns out, it’s one of the Canary Islands, so I’ve been in the neighborhood before. If you don’t know where the Canary Islands are, I suggest Google Earth. My new best friend Andy (anyone who invites me to their home, supplies me with unending amounts of barbecued shrimp, cold Corona and Cuban cigars and allows me to post about my book on their blog–which is supposed to be about their book–is automatically my best friend) not only located Tenerife on a map, she moved here. Seems she got tired of the stunning scenery, the variable climate and amazing history of Britain and decided to settle for constant sun, sandy beaches and spectacular mountain vistas. In a long ago December, I left my land of cold and snow in upstate New York (try minus 28 degrees centigrade, Sparky, and we measure our snow in feet, not centimeters) for a week of sun and surf and scuba diving in St. Maarten. I was so totally captivated by the sunshine, warm ocean breezes and laid-back life style that I actually did begin looking into moving there. It turned out to be a daunting task. What I needed was an AndyMont of St. Maarten to have written “Going Native in St. Maarten,” but there was nothing of the kind. Too bad, I could now be enjoying a life of simple pleasures, making a living carving drift wood into tourist-pleasing shapes or serving drinks with umbrellas in them to sunburned New Yorkers, rather than having to go on these grueling tours just so I can sell enough books to help me pay my heating bill through the long, damp British winters. Now where was I? Oh yes, Britain, and leaving it. Being a relative newcomer to Blighty, I still regard Britain as an exotic place, so I’m happy to remain there. Besides, dark and dreary as it can be, the climate is still paradise compared to what I left behind. It’s all a matter of perception. Even so, Andy won’t have a hard time convincing me to come back for a visit. Would you like to participate in the 2009 KINDNESS of STRANGERS TOUR? Beneath the gaze of a shimmering moon, in the shadow of the tower that guards the cross placed in the ground by Spanish Conquistadores and after which the city of Santa Cruz is named, on Thursday night it was the turn of the Irish to conquer the city. We arrived at the top of the Noria district on a hot and sultry night to a crowd of a couple of hundred people milling around the small park beneath the spreading boughs of the flame of the forest trees. Leaving Jack to find pole position for his photography, Jesús and I headed off to JC Murphy’s to get the beers in. 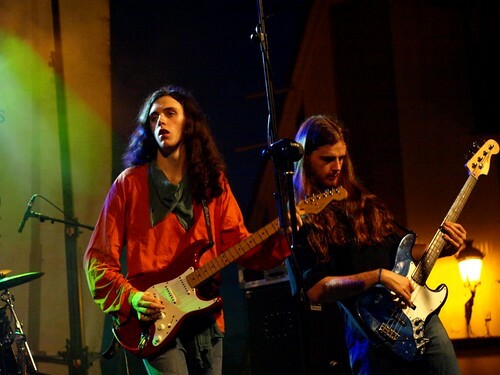 It was the start of the Santa Blues Festival and a young Irish band called The Deans were scheduled to open the festival. I’d read reviews and listened to the discography on their website and was pretty certain we were in for a treat. The usual chaos and inefficiency reigned at the bar of JCs which, combined with Jesús’ “it’s okay, Man, it’ll happen when it’s supposed to” hippy drippy attitude to getting served, meant that by the time we got back to Jack, the 3 lads from Galway were already on stage and the audience had swelled and shuffled quietly closer to the action. I knew the guys were young but I wasn’t quite prepared for the baby-faced, hat toting, Arlo Guthrie looking youngster with his long frizzy black hair, orange shirt with green neck scarf and sash and his suede jacket, who pulled his guitar strap over his shoulder, smiled at his handsome bro’ on bass and ripped into the opening chords of what was to be a heart stopping, incendiary performance. With all the professionalism of seasoned circuit-tourers and the freshness of first timers, Gavin (Arlo Guthrie) Dean, his bassist brother Gary and drummer Gary Keown took Santa Cruz by storm. From classic blues rock numbers to songs off their new album ‘The Album‘ (couldn’t think of a name, eh, lads?) including ‘Snakes and Ladders’ and the anthem ‘Carnival Blues’, The Deans reminded us what great performances are all about; the sheer joy of the music shone from their faces and carried them on a wave of euphoria that surfed us all along in its wake. From the opening ‘Whoa!” to the impromptu leaping onto a stack system by Gavin (much to the annoyance of a roadie who really should get a job in the Inland Revenue) and whipping the audience up into a frenzy, The Deans were breathtakingly sensational. “We’d play all night if they let us!” Gavin screamed into the mike, and you just knew he wasn’t kidding. Suitable elated and feeling even hotter from the closeness of the now considerably larger crowd that The Deans had gathered it was time for my hippy friend and me to negotiate the frustration that is getting served at JC Murphy’s. Even as we turned our backs on the stage and began pressing through the crowd, the Vargas Blues Band were already on stage and tuning up. Luckily it was my round so there wasn’t going to be any nonsense about waiting for the vibes to work in our favour. One look at the six-deep throng around JC’s bar and I turned on my heels and headed up Santo Domingo to a chic restaurant, through their doors and straight to the bar area. In two shakes of a lamb’s tail we were slopping lager all over feet on our way back to Jack and the distant dream of our places at the front of the stage. Looking like The Deans’ granddads, the Vargas Blues Band exuded experience and professionalism. On lead guitar Javier Vargas wouldn’t have looked out of place in Glastonbury this weekend playing with the E Street Band. His Mark Knopfler fretwork sang through the hot night air while he coolly moved only his fingers and his jaw bone, never breaking a sweat and letting his guitar do all the work. On vocals Tim Mitchell was two world class vocalists in one; Al Green and Barry White and both sat comfortably side by side. I have never heard such a range sung so sweetly; the guy went from tenor to baritone like flicking a switch. At one point he sang a duet with himself and you’d swear if you weren’t watching it with your own eyes that there were two different people on stage. 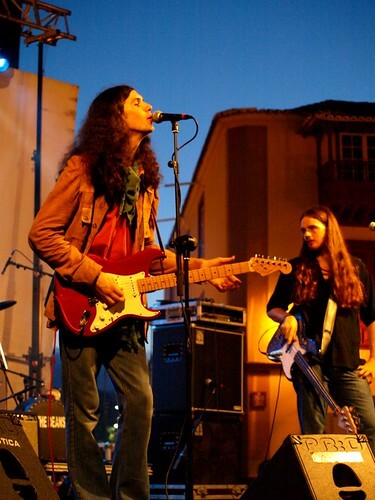 Through classic Blues rock, the occasional venture into Hendrix and a brief rendition of La Cucaracha, the Vargas Blues Band gave a flawless and soulful performance. But for me, the night belonged to the Irish. 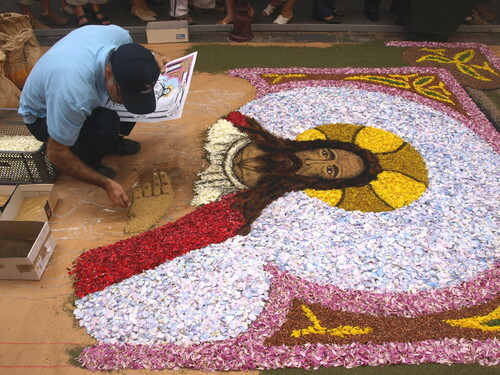 What do you think, Jesús? Oh, he’s not here, he’s still waiting at JC’s bar for the right Karma to come round. Well the nights are sultry, the stage is set beneath the ‘flame of the forest’ trees at the foot of the iconic tower of the Church of La Concepción and JC Murphy’s have stocked up on the Guinness. That all means it must be time for the Santa Blues Festival. This year, instead of spreading the music out over three consecutive Fridays, Santa Blues is going to be held over the coming weekend with three nights of cool, Blue sounds carrying on the mid summer night air. 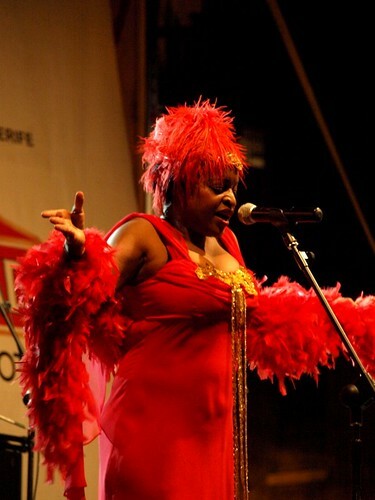 Friday 26th June 2009, the Canaries own Laskina and the emotive Blues/Gospel voice of New Yorker Michele McCain. 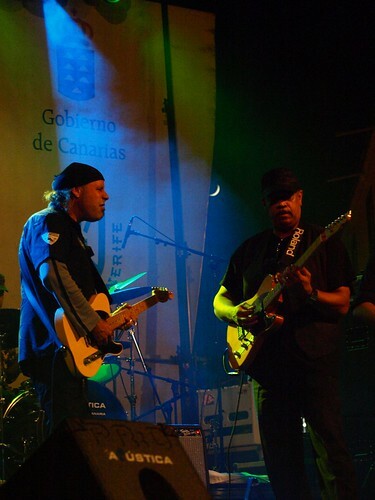 Saturday 27th June 2009, local heroes The Santa Blues Band and the ‘Sacred Steel Guitars’ of The Campbell Brothers. Some aromas just make you smile. For me it’s the scent of hot pine needles which remind me of hiking through sun dappled forests; freshly mown grass which conjures up camping trips to Cornwall, the Lake District and Wales; candyfloss and toffee apples which transport me back to childhood fairgrounds and …toasted grass seeds. 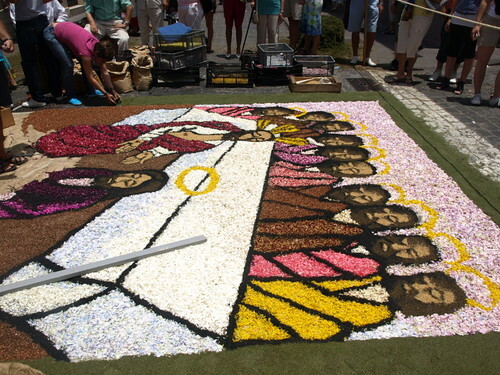 No, not the sort you smoke (though come to think of it that should be on the list too), but the sort that the Alfombristas (carpet makers) of La Orotava use to outline, silhouette, create shadow and background to their floral masterpieces during the Feast of Corpus Christi. Yesterday we arrived in the Baroque town of La Orotava which lies in the valley of the same name above the northwest coast of Tenerife at about 11am. 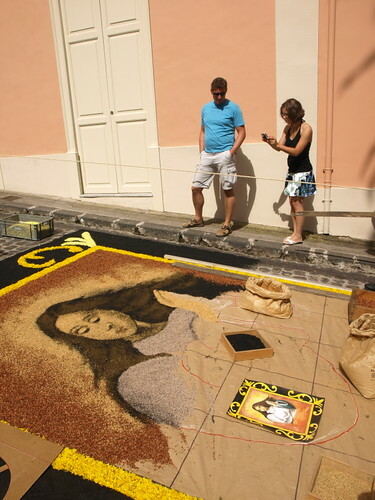 Sweating in the already hot sun as we laboured up the cartoon-sized incline of the cobbled streets, the aroma of toasted grass seeds assailed my nostrils and a broad smile crossed my lips. I remembered spending last year here with Pamela from Secret Tenerife and her friend José ‘Mataparda’; wandering endlessly around the burgeoning carpets, drinking beer outside a Guachinche and eating carne machada arepas at an arepera near the bus station…happy days. 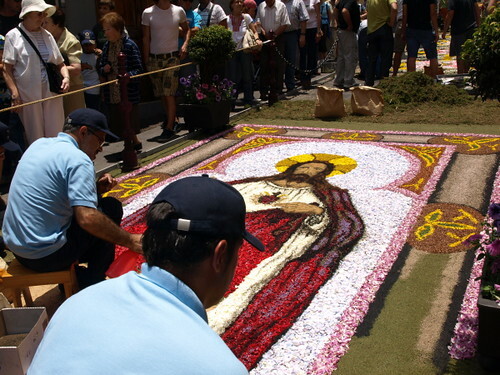 As we made our way towards the Ayuntamiento where the main sand and soil tapestry occupies the plaza, some of the flower carpets in the surrounding streets were already well underway whereas others had barely begun. It’s one of the great joys of the day, wandering in a continuous circuit of the carpets watching as they take shape and form, transforming before your very eyes from ‘do you know what it is yet?’ status to ‘ah! It’s the La Orotava skyline at sunset’. 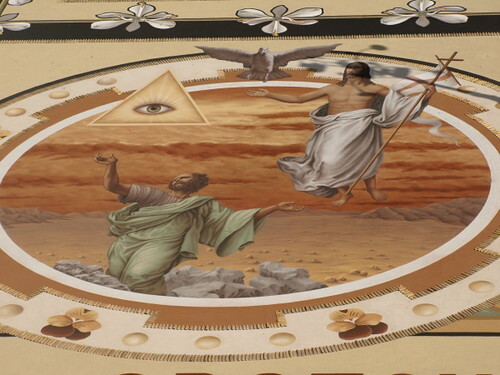 It took us almost two hours to do one circuit and to go up to the balcony of the Ayuntamiento from where we could photograph the main tapestry. While there, we noticed that there were people on the roof of the church of La Concepción and we headed that way to try our luck. Eagle eyed Jack spotted ‘Mataparda’at a small balcony half way up the tower and we went inside to meet him. José took us up the narrow winding staircase of the tower to the window we’d seen him from and Jack took some photos before we continued towards the roof. 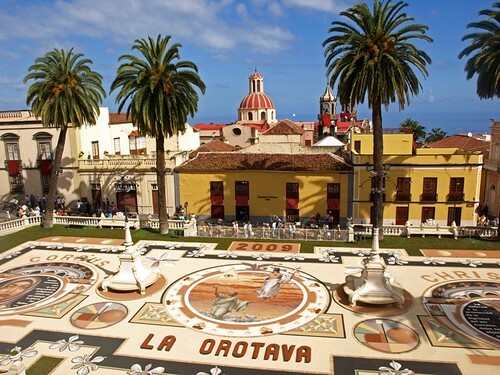 Just as it seemed we were about to have La Orotava at our feet we were stopped in our tracks by a trainee jobsworth who insisted that no-one else could go onto the roof as last night’s rain had left the surface too slippery and dangerous. We retreated back to ground level where we were joined by Colin (easy to spot with his blonde hair and ubiquitous CD Tenerife football top). By the time we got back out into the sun it was definitely lunch time and we headed to the little Gauchinche by the side of the Town Hall where José treated us to beer and pinchos. Another perfect day and one which ought to be on the ‘must see’ list of every respectable traveller. I’ll let the carpets speak for themselves and I’ll consign the smell of toasted grass seeds to memory for another year. 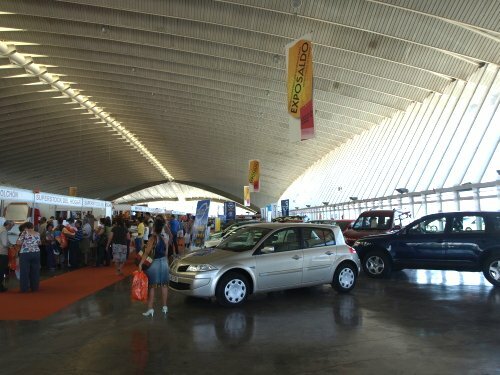 Last week Jack and I visited ExpoSaldo in Santa Cruz; a huge annual market of stock clearance items where you can grab a bargain in anything from tights to Toyota Land Cruisers and everything in between. It was very hot and a bit breezy, which is about par for the course in Santa Cruz, and it felt great to get into the air conditioned cool of the Centro Internacional de Ferias y Congresos building. Seeing the ranks of new and used cars and motor bikes at incredible knock down prices and stepping onto the escalator to get to the upper concourse where the shoes and clothes were, I was already mentally drawing up a list of things I could possibly sell at a car boot sale to fund this outing. 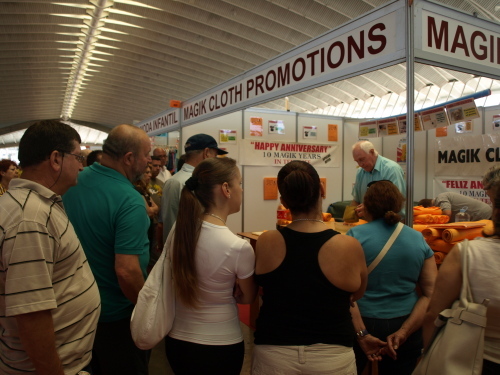 We began our meticulous inspection of every stall, moving up one aisle and down the next so as not to miss anything. So many times I felt my hand twitch towards my credit card as I passed bargains like a hairdryer, iron and electric fan, all 3 for €9.99; racks filled with beautiful summer dresses at €8 each and sandals at 2 pairs for €5. Its a kind of Magik...! And he’d wring the cloth to release the water back into the bowl. Now he had people hooked, they were obviously interested. But with complete and utter incomprehension of a single word spoken plastered across their faces, they were waiting for the key piece of information…el pressyo. People start to walk away assuming that he’s telling them that’s the price. But it’s only a couple of people who have stayed to hear the final price and last I saw, he was bagging up two sales. I felt really sorry for the guy and couldn’t understand why he hadn’t got someone to translate his sales pitch into Spanish for him. I could only surmise that he’d travelled up from the south and was expecting his audience to have a high English speaking content. He was wrong; I never heard another English voice apart from his. I very rarely do in Santa Cruz. I hope he managed to sell more of his Magik Cloths and if he’s reading this now, I’m available to translate and do the pitch for you…at a pressyo pour supwesto! From the moment we leave the TF motorway and hit the outskirts of Santa Cruz, we can tell this isn’t just any Saturday afternoon. This is like driving up Sir Matt Busby Way on the last home game of the season when Man Utd are about to be presented with the Premiership trophy; except that instead of red, it’s blue and white. Groups of fans are everywhere, carrying huge flags, wearing full CD Tenerife strip, waving blue and white scarves and refilling drinks from cool boxes every couple of hundred yards. They’re chanting and waving at the blaring horns of passing cars that have flags flying out of every window as they continuously circle roundabouts like they can’t find an exit. Parking the car and heading down towards Plaza España we’re joined by more and more fans; groups converge from side streets and out of parked cars until we’re a mini army as the Plaza finally comes into view. In my time I’ve been to Glastonbury Festival and Old Trafford, I’ve danced til dawn in a sea of revellers at Carnaval and I spent 12 hours in the very eye of Times Square on the Eve of the Millennium but I’ve never witnessed such a surge of excitement as that being generated by the swarms of fans occupying Plaza España, Plaza de la Candelaria and Calle Castillo to watch the away game against Girona from which CD Tenerife need just one point to secure promotion. 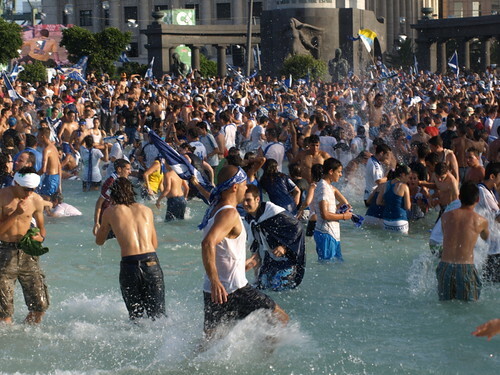 Thousands and thousands of blue and white bodies are dancing and jumping in the blistering heat of the late afternoon. Everyone has a scarf or a flag or both which they’re waving frantically above their heads. Horns are blaring, somewhere a group of drummers are pounding out a beat, there’s music coming from somewhere but it’s impossible to hear it above the roar of the crowd. We make our way into the centre of the crowd and try to manoeuvre so that we can get a view of the screen which is way too small for this number of people. But no matter which way we try to move, it’s impossible to get a decent view between the flags, the telephone poles and the fans who are standing on concrete footings. We settle for a split screen view positioned slightly behind a pole and watch the Cabildo building clock as it ticks down towards kick-off. The ground is littered with cool boxes, carrier bags and rucksacks stuffed with bags of ice and cans of beer. There are empty beer cans and bottles strewn everywhere, empty crisp packets and of course the usual mountain of sunflower seed husks. Somehow I can’t see sunflower seeds ever replacing hot pies on the cold and wet terraces of Old Trafford, but here they seem to be the staple diet of football fans. At 5.30 pm the ref’s whistle blows and there’s a roar from the crowd. For every pass of the ball by Tenerife there’s a deafening cheer and for every half chance that passes for a shot there’s a loud “Ooooohhhh” even though nothing’s remotely close to Girona’s nets. After about ten minutes there’s a shot which appears to be on target and the whole place erupts. Beer is spraying all over us from a group of lads right in front of us who clearly think they’re on the winning podium of Formula One Racing but can’t afford the champagne. There’s screaming and flag waving and mad embracing and finally someone points out that it’s not actually a goal and the euphoria’s replaced by embarrassed apologies about the spraying and rueful regret of the wasted alcohol amidst howling laughter. But then in just one instant of one man kicking a ball at the right time and in the right place the dream of an entire island becomes a reality and I suddenly ‘get’ what makes Tinerfeños wear traditional costumes whenever they get the chance and choose to listen to traditional music that’s about as cutting edge as Tommy Steele’s ‘Little White Bull’. The sense of belonging is overwhelming; a sense of being a part of something that’s rock solid, an identity that’s held fast over 500 years of progress by the rest of Europe that’s just passed alongside this island, touching it but not changing it. This isn’t club football, CD Tenerife is the national team to this island. This is what 1966 felt like and what we’ve been trying to get back ever since. The scoreline remained at 0-1 but it didn’t matter. The euphoria that was born when that goal went in never waned and when the ref’s whistle blew it spilled over from the Plaza to the fountain where the waters baptised the faithful, and everyone else within a 50 yard radius of it. I’ve just been wondering around the beautiful courtyard of the former Convent of Santo Domingo where up until Sunday, as part of the Agatha Christie Festival, they’re staging an exhibition of photos of Puerto de la Cruz in the 1920s, around the time the famous crime writer visited these parts. Agatha Christie and her daughter, Rosalind visited Tenerife in 1927 and stayed at the Hotel Taoro in Puerto de la Cruz. It was a difficult time for Agatha; her husband had fallen in love with another woman and had petitioned for divorce and her mother had recently died. Agatha found peace and tranquillity in the garden of Sitio Litre in La Paz and inspiration, it is claimed, for the creation of her personal favourite character; The Mysterious Mr Quin’. She also penned a short story while she was on the island; ‘The Man who Fell from the Sea’, a part of her Mysterious Mr Quin short story collection. 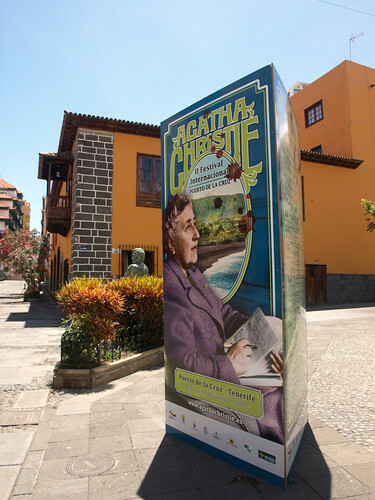 In 2007 Puerto staged the first ever International Agatha Christie Festival to mark the 80th anniversary of the great lady’s visit to the town and it was such a huge success that this year they’re currently running the festival again. As well as the exhibition there are theatre productions, screenings of ‘Mrs McGinty’s Dead’ and ‘The Mirror Crack’d’ in the original language, a vintage car exhibition and tea dances; and with Agatha’s portrait positioned all over the place as part of the proceedings, the town feels oddly British at the moment. Still, any day now the mainlanders will arrive in their droves (economic crisis notwithstanding) and there’ll be a whole different feel to the place.